We have already celebrated our first Thanksgiving. 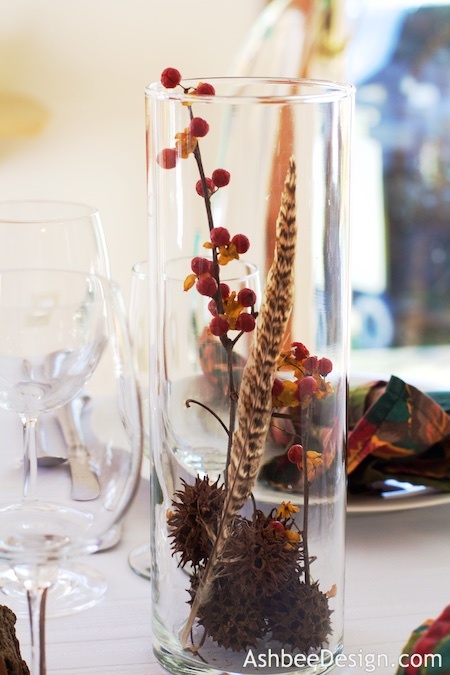 On November 21st we hosted "Alternative Thanksgiving" at our home. Because many of us are going in other directions for the main event, we hosted an earlier version yesterday. It was the complete deal, and I spent some time creating a new centerpiece for the table. Do you remember my log slice vases? 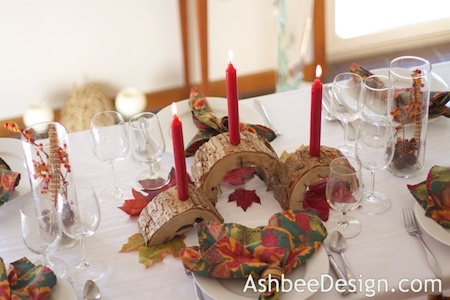 Well, same tree but different slices and cut in half to make a quick and easy centerpiece. A couple of years ago my husband was cutting up a downed pine tree with a hollow center. I requested some slices and have been storing them in the top of the garage. I sliced a few in half on the band saw, sanded the edges and drilled a 7/8" hole in the top for a standard candle. I also added some seed pods to the bottom of some glasses cylinders along with a sprig of bittersweet and a found feather for additional interest. I was pleased with the final result - a nice nature inspired Thanksgiving table.